Are you planning to throw a groovy party in the house this Saturday night and need professional Cleaning Services immediately next day to escape the fury of your parents who would be returning the same day? Do you wish to obtain customized Cleaning Services for your office premises to provide a clean and healthy work environment to the employees? We are a professionally managed company located in Alwar, Rajasthan and can offer you services that exactly suit both your schedule and budget. Our manpower is highly trained and is well-versed with most modern equipment. Many of our clients have attained our annual services and have ensured all year round safety from dirt and grim. 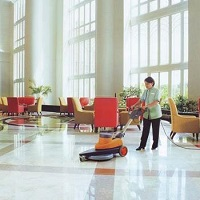 We provide services for office cleaning, apartment cleaning and building management. Our skilled manpower is capable of doing both trivial and intricate tasks such as glass cleaning, gardening, trash removal, carpet/upholstery shampooing etc.